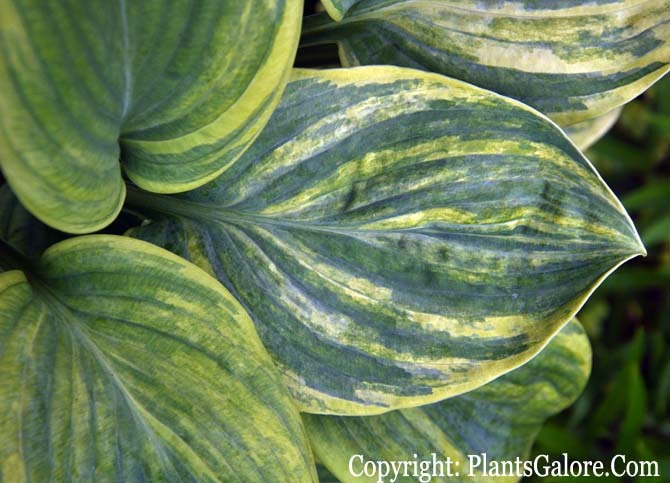 Registered by Dorothy's husband, Dr. Ralph (Herb) Benedict of Michigan in 1983, this large size (26 inches high by 60 inches wide) hosta has blue-green with yellow streaked variegation. The foliage is heavily corrugated, convexly cupped and has thick substance. Dense clusters of near white flowers bloom from mid-June into July followed by viable seeds. This is a self-pollinated seedling of H. 'Frances Williams' is very highly prized as a pod parent by a number hosta hybridizers. Hosta cultivars named for several renowned hosta people including 'Van Wade', 'Gil Jones', 'Jim Wilkins', and 'Hideko Gowen' are the results of crossing with this cultivar. 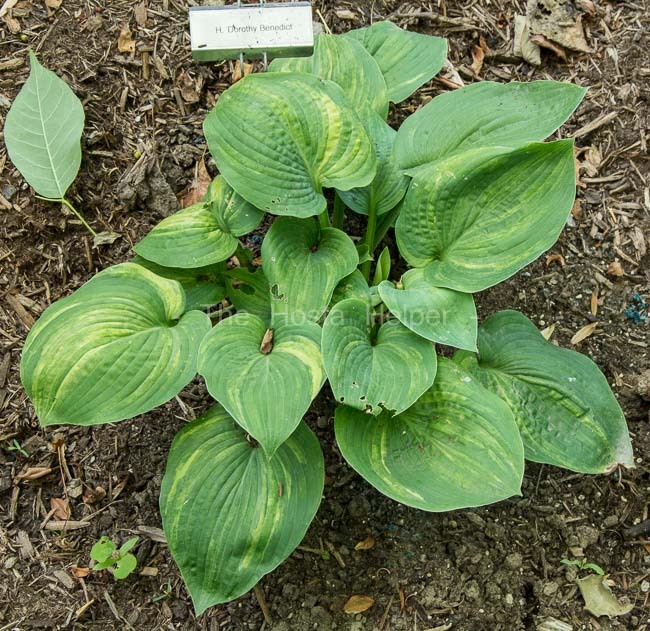 According to The Hostapedia by Mark Zilis (2009), "Herb Benedict contributed many great plants to the world of hostas, but this cultivar may be his best. It is only fitting that it honors his wonderful wife and hosta partner. The original specimen of 'Dorothy Benedict' exhibited only limited variegation, but, over the years, Herb selected shoots with heavily variegated foliage and continually improved the plant. Of minor importance is its good ornamental value in the shade garden. 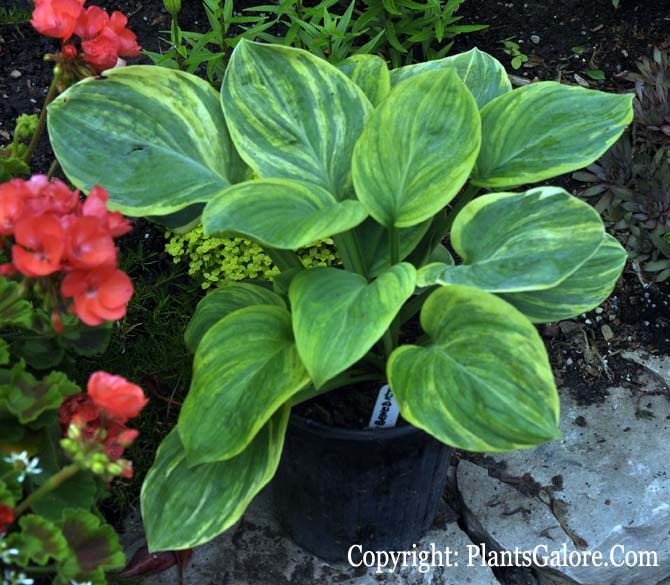 'Dorothy Benedict' is now considered the premier breeding plant in the world of hostas for its ability to produce variegated seedlings with thick, H. 'Sieboldiana'-type substance. Additionally, many 'Dorothy Benedict' seedlings have become important breeding plants." 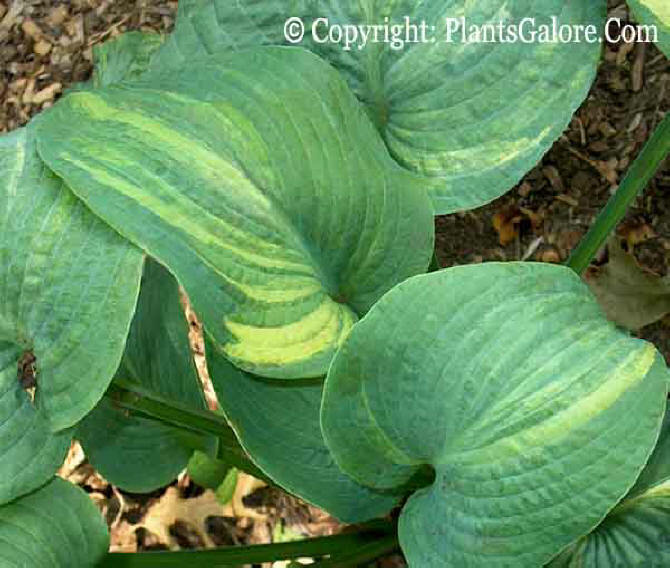 The New Encyclopedia of Hostas by Diana Grenfell (2009) states: "Very slow growth rate. Very rare. Prized as a pod parent in producing seedlings of good substance. Among the most attractive of its type. Makes a striking specimen in the garden." An article about H. 'Dorothy Benedict' by Herb Benedict in The Hosta Journal (1991 Vol. 22 No. 1) states that, "Prior to 1978, many growers, Donahue, Aden, and others, failed to get splashed seedlings after planting thousands of 'Frances Williams' seeds. I thought I would give it a try. During July, 1978, I selfed (self-pollinated) the blooms...The next year, in late May, about 200 seedlings came up. A few were gold and all the rest green or blue-green except one that had a narrow gold stripe in each leaf...It bloomed for the first time in 1983 at the age of 4 years. It was named for my best friend, Dorothy Benedict, and registered...During 1990, the six best, 7 year old seedlings were named and three were registered." #1. 'Gil Jones' A large upright H. 'Sieboldiana'-type, with blue-green leaves and a wide cream edge. #2. 'Jim Wilkins' A low spreading reverse with a cream center and with a blue-green border on its leaves. #3 'Hideko Gowen' A tall, upright reverse with a maple leaf cream center, a wide green edge and a thick cupped round leaf. #4 'Tom Boy' A small, slow-growing miniature H. 'Sieboldiana' with a chartreuse edged, cupped, round green leaf. #5 'Ruby Benedict' A low, spreading, very gold leaf with a green edge, and a very puckered, round leaf. #6 'Bashful Polly' A wavy edged, splashed leaf. Another 'Dorothy Benedict' seedling, grown and registered by Jim Wilkins, is 'Herb Benedict', a splashed, round leaf with blue overtones and winner of the Savory Shield Award in Jackson (MI), 1988, for the best new seedling growing in a National Convention of The American Hosta Society tour garden." Warren I. Pollock in The Hosta Journal (2004 Vol. 35 No.3) says, "It was at the 1997 National Convention of The American Hosta Society in Indianapolis, Herb Benedict brought a piece of 'Dorothy Benedict' to the auction. Though Herb had registered this cultivar in 1983, it was still extremely scarce...Jerry Hadrava of Cedar Rapids, Iowa, I was told, was overheard saying he was going to buy this 'Dorothy Benedict' at any cost. Well, the winning bid was $3,000.00 and it was Hadrava's."